This was THE weekend for soggy festivals – from the music lover’s Glastonbury to the petrolhead’s Goodwood Festival of Speed. We’re concentrating on the latter, with this year’s theme of ‘Full throttle – the endless pursuit of power’. Just as extreme is the Ferrari FXX K (yes, it really is called that). The hybrid race car produces an incredible 1,035hp and is good for 220mph. The £1.9 million Bugatti Chiron hypercar made its UK dynamic debut at this weekend’s Festival of Speed. With a power output of 1,500hp, the Veyron successor has a top speed of 261mph. This is the LMP1 car that Porsche has just used to win Le Mans for the second year in a row. The Porsche 919 Hybrid weighs just 875kg and is powered by a 2.0-litre four-cylinder petrol engine, combined with a large electric motor. The historic Lancia 037 Group B rally car was the last rear-wheel-drive car to win the WRC. 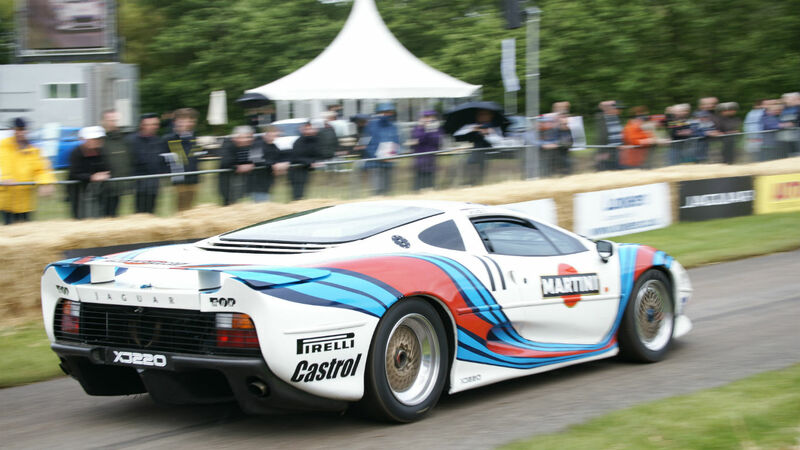 No doubt a bit of a handful at a wet Goodwood, the Lancia 037 is now more than 30 years old. Stepping away from the hill climb now and looking at what else Goodwood had to offer. On Vauxhall’s stand was this Maloo, carrying one of the oldest Vauxhalls in existence. Over on Goodwood’s Cartier Lawn was the ‘Style et Lux’ concours, featuring a myriad of exotic and rare cars. 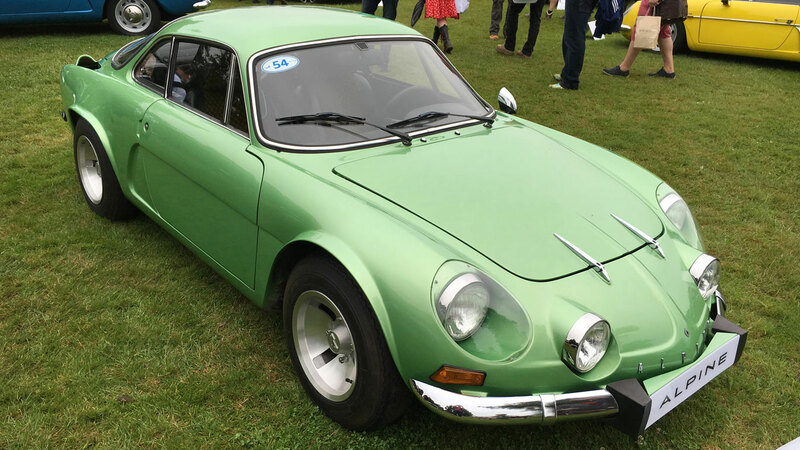 This TVR Trident is one of just four ever made. Celebrating the 50th anniversary of the original 2002 turbo, the Hommage is based on the five-star BMW M2. 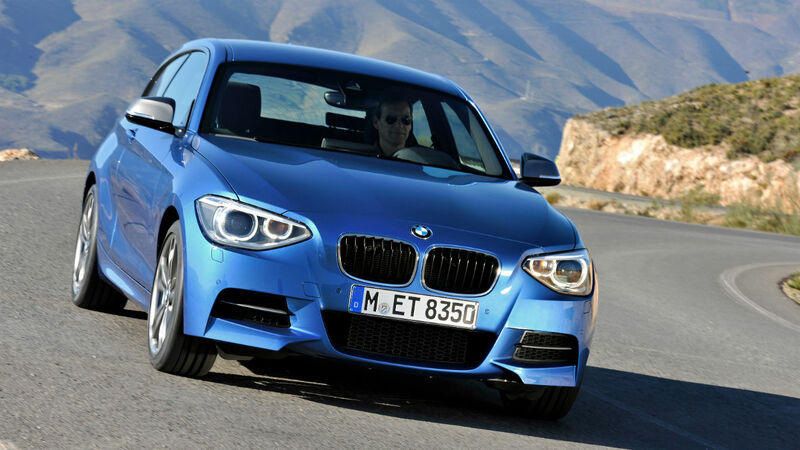 Its compact dimensions and ‘shark nose’ grille give it an aggressive look. Unfortunately, it’s a one-off. With BMW celebrating its centenary year at Goodwood, there were lots of amazing BMWs old and new on display. 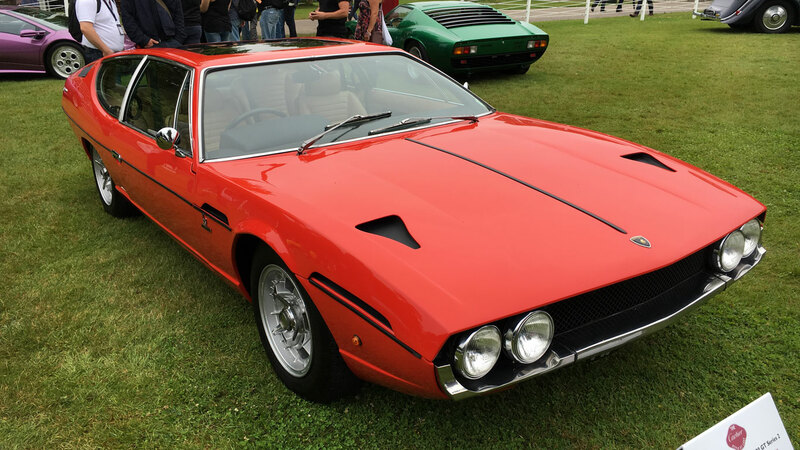 This M1 caught our eye – with its mid-mounted engine and sleek Italian styling, it’s a very desirable classic car. Set to take on the Porsche 911 GT3 RS, the ultra-hot (and ultra green, literally) Mercedes-AMG GT R made its debut at Goodwood. Here it is, taking centre stage on the firm’s huge show stand. And here it is, roaring up the hill. With a new exhaust system and twin-turbochargers, the GT R packs 585hp from its 4.0-litre V8. It’ll hit 62mph in 3.6 seconds. Unsurprisingly, McLaren’s section of the supercar paddock was drawing the crowds over the weekend. The 675 LT Spider, pictured here, costs an incredible £285,450. Think the regular 205 GTI is pretty special? It’s got nothing on the Group B 205 T16. Packing an incredible 500hp, this ‘hyper hatch’ was no doubt a bit of a handful on the wet hill climb. Land Rover took along its mobile off-road course to Goodwood, with even appalling conditions failing to give the Evoque’s terrain response a workout. No, this isn’t a scene from the Festival of Speed car park (although it could have been). Porsche showed off the abilities of its Cayenne 4×4 on wet mud, using cars borrowed from its Experience Centre at Silverstone. Honda showed off the new NSX at Goodwood, but we prefer this original version – developed with help from none other than Ayrton Senna. It blew away the rival Ferrari 348 when launched in 1990. There aren’t many things that sound better than a Lamborghini Huracan at maximum attack. And opting for the roofless version means you can enjoy that 610hp V10 in all its glory. Ciao bella! The RE40 was the first Renault F1 car to have a full carbon fibre chassis. It also had a 1.5-litre V6 engine producing a mildly terrifying 880hp. 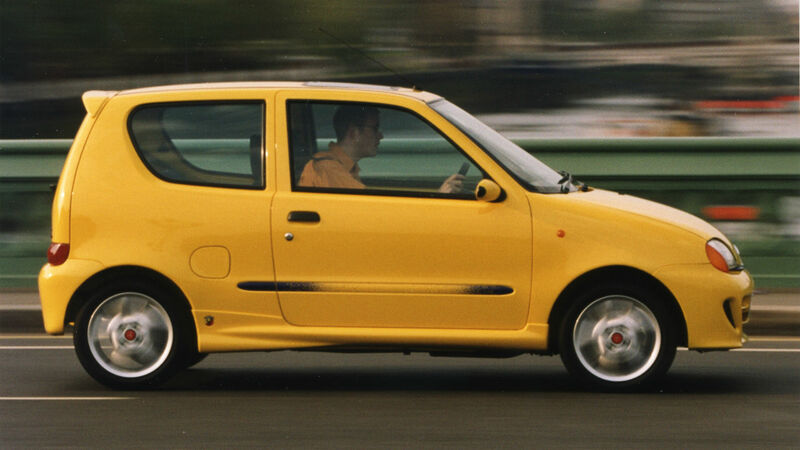 No wonder it took the great Alain Prost to tame it. What’s even better than a McLaren P1? Yes, the racing-spec P1 GTR, with power boosted to 1,000hp, weight reduced by 50kg and a weapons-grade aero package. The paintwork on this car was inspired by much-loved racing driver, James Hunt. The beautiful Aston Martin DB11 treated the crowds to its cultured V12 howl. After making its debut at the Geneva Motor Show earlier this year, this was the first chance to see Aston’s new supercar in action. The hottest Golf GTI arrived from from its record-breaking lap of the Nurburgring. It’s the fastest front-wheel-drive car ever around the notorious German racetrack, with a time of 7min 49.21sec. This Porsche 911 is half Lego and half the real thing. We have three questions. How long did it take to build? Does it drive? And can we have one for Christmas? Posing next to a P-51 Mustang fighter, the Shelby GT350 is one of the fastest and most sought-after versions of the original Ford Mustang. Spot the GT40 in the background, too. 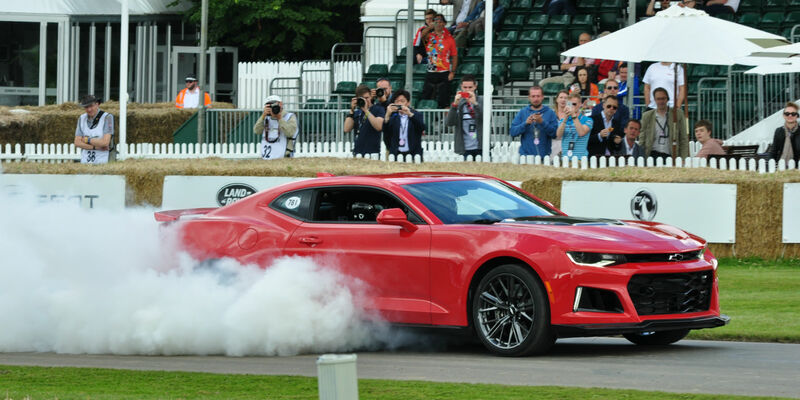 Goodwood has become the de facto British Motor Show in recent years. The Alfa Romeo Giulia saloon made its UK debut here – allowing punters to compare it to the rival Audi A4 and BMW 3 Series. The Cartier Lawn has been a key part of the Festival of Speed since 1995. The Style et Luxe provides some welcome calm, away from the speed and the sound of the Goodwood Hill. 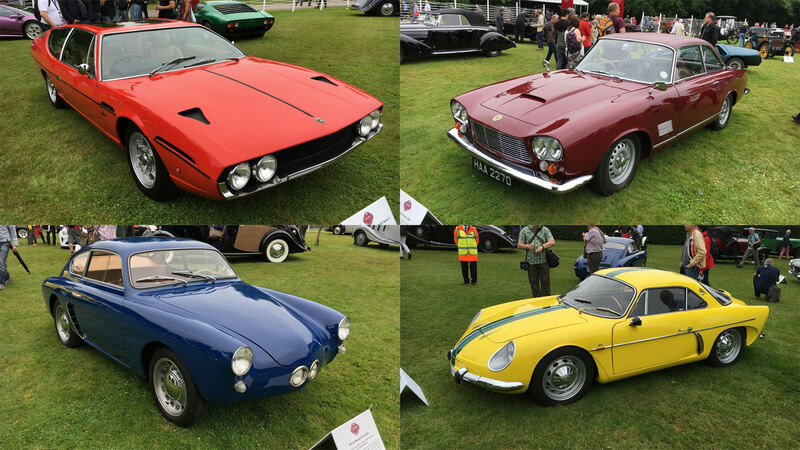 We took a wander around the lawn to select our favourite concours gems. 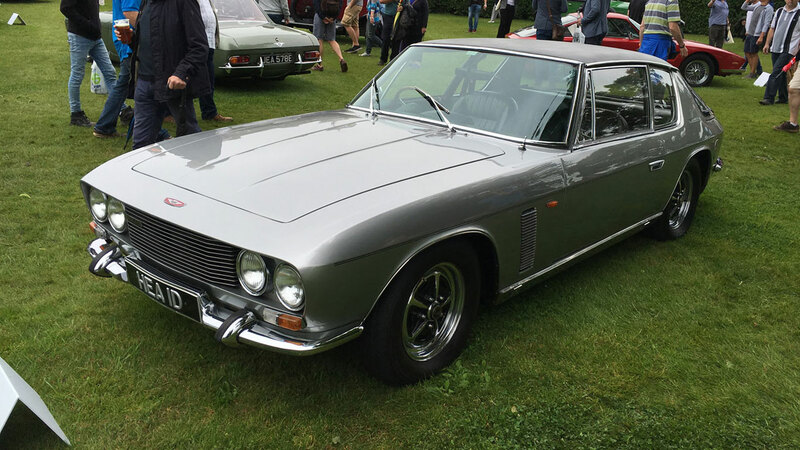 The Jensen Interceptor entered the stage in 1966 and was powered by a Chrysler-sourced V8 engine. It was more of a GT car than an outright sports car and featured such ‘luxuries’ as the world’s first dimming interior light. The car on display at Goodwood is the very first production example and is said to be in an original and unrestored condition. From one of the first of a breed to one of the last. This 1977 Alpine A110 SX was the very last of the 7,579 A110s to roll off the Dieppe production line. It’s finished in super-rare Normandy Green and features the rear lights from an Alfa Romeo 2000 GTV. These were an option in certain markets, with Renault 8 units fitted to domestic market cars. It needs no introduction, does it? 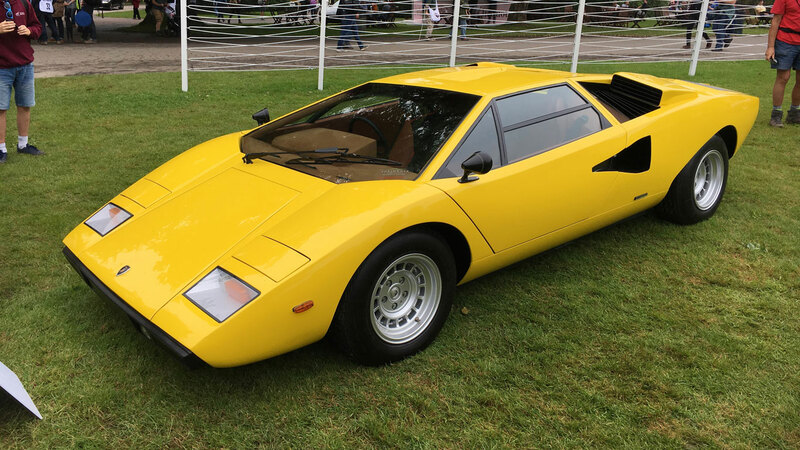 This early ‘Periscopo’ Countach is one of only 10 right-hand drive cars built, out of a total of 150 LP400s made between 1974 and 1977. This is something you don’t see everyday, not least because a mere 81 cars were produced between 1966 and 1974. It’s a multinational affair, featuring an Italian body, British chassis and all-American Ford big-block V8. Illustrious though it was, sales were hampered by an extremely high price – twice that of a Jaguar E-Type. 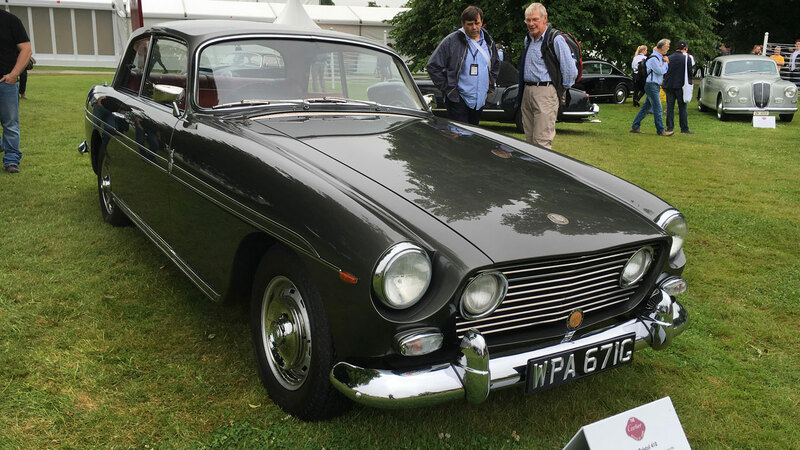 The Bristol 410 was the fourth in a series of five cars, beginning with the 407 and culminating with the 6.2-litre Chrysler V8-engined 411. The 410 was launched at the 1966 Earls Court Motor Show and was powered by the smaller 5.2-litre Chrysler V8. After years using a BMW straight-six engine, Bristol turned to Chrysler of Canada to support the Commonwealth. This Espada is of many cars owned by Harry Metcalfe of Harry’s Garage fame. The founder of Evo magazine has a number of exotic cars at his disposal, but few are as fabulous as this Lamborghini. With four proper seats, this was a Lamborghini you could use daily, assuming you could live with the thirst of the V12. Sat amongst the towering Rolls-Royce and the vast supercars, the yellow Willys Interlagos A108 looks so delicate and petite. It’s an Alpine A108, but built by Willys Overland in Brazil. A clever move by cash-strapped Alpine, as it provided an alternative route into overseas markets. If there were any doubts that Lancia produced some of the world’s finest vehicles, the Flaminia 2500 Sport Zagato kicks them into the middle of the Ligurian Sea. 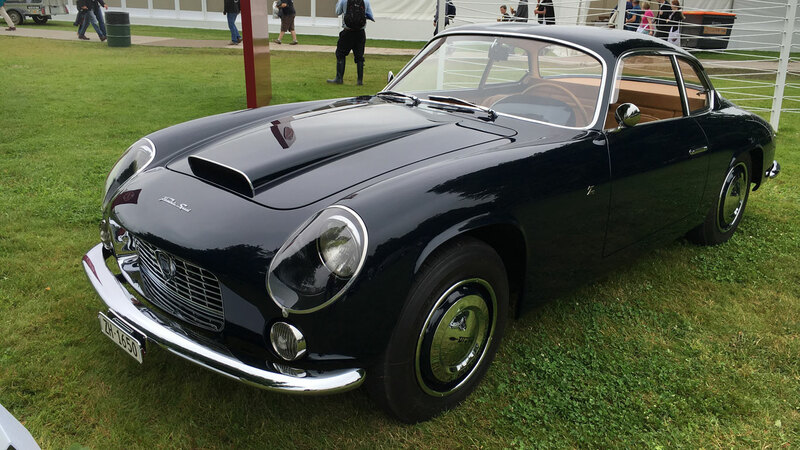 Powered by an improved version of the Aurelia’s V6 engine, the Flaminia featured disc brakes and tinted glass – both firsts for an Italian car. The Sport Zagato was the most desirable version, boasting a ‘double bubble’ roof. 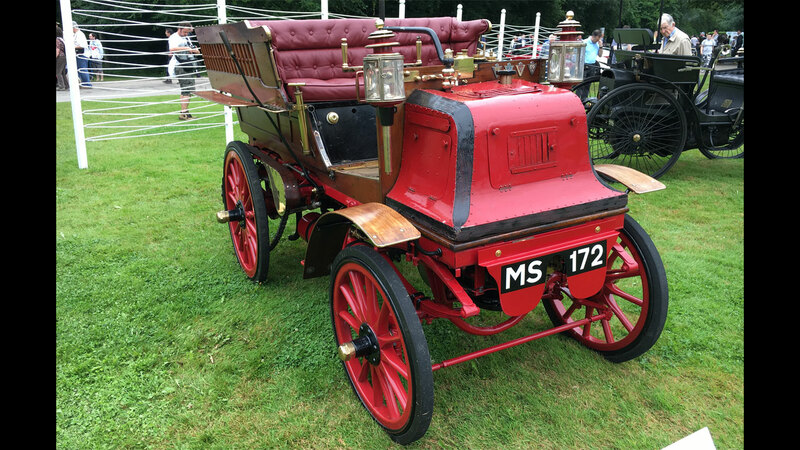 The first British-made Daimlers took to the road in 1897 and this is thought to be one of the earliest survivors. Unlike many other early Daimlers, this ‘coach with no horse’ retains it’s original tiller steering. Top speed – a blistering 15mph. Still want that horse-drawn vehicle? Goodwood isn’t just a place to ogle beautiful classic cars – you can buy them, too. The Bonhams Festival of Speed auction takes place on 24 June 2016 and lots range from seven-figure Ferraris, such as the 275 GTB/6C Berlinetta seen here, to a one-off prototype MGB. 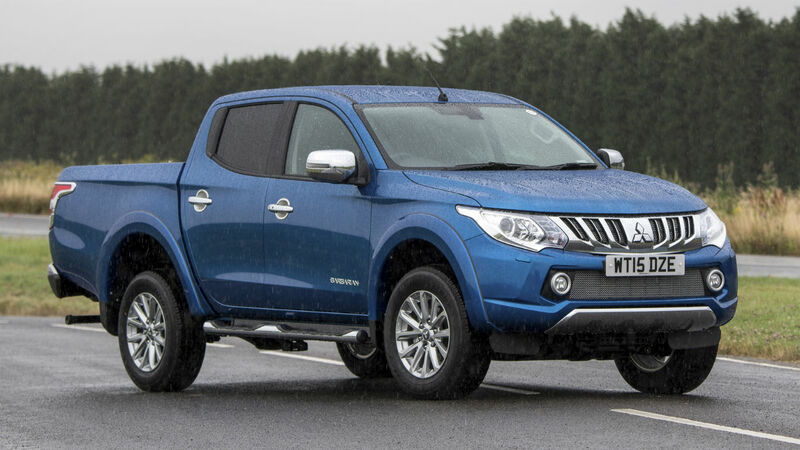 We’ve picked the cars we think stand out in this year’s sale. Whether you’re a serious shopper or an armchair browser, there’s something for everyone here. The 1978 M1 was BMW’s only true supercar until the i8 arrived in 2014. 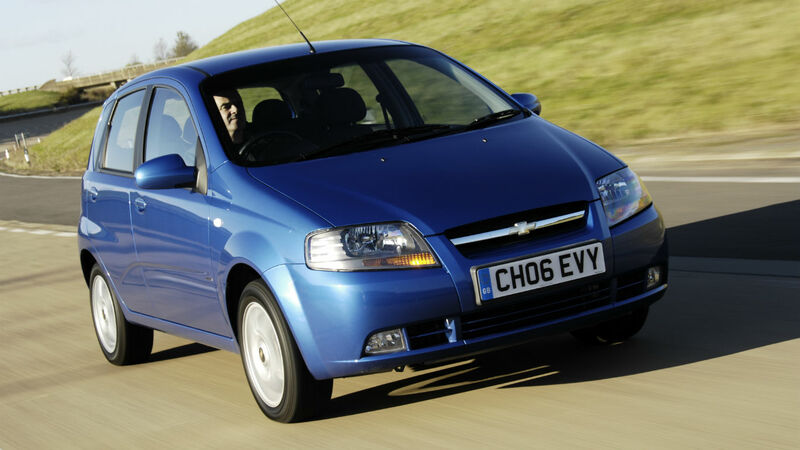 A few years ago, we remember these mid-engined, six-cylinder coupes selling for about £70,000. Now, Bonhams expects this car to fetch £280,000 – £320,000. Designed by Giugiaro – the man behind the original Volkswagen Golf and Lotus Esprit – the M1 was originally supposed to be built by Lamborghini. Financial problems caused the Italian supercar maker to withdraw from the project, leaving BMW to finish the job in-house. Only 453 M1s were made – this example is number 413. It might have Italian styling, but M1’s cockpit is unmistakably German. Note the period Becker radio/cassette. A 227hp power output is modest by today’s standards (a Ford Focus RS has 350hp), but the lightweight M1 could hit 60mph in just 5.4 seconds, and 100mph in 8.0 seconds. How about this for a change of gear? The Volkswagen Microbus is synonymous with hippy culture, and the 23-window Samba version is particularly sought-after. You’ll need to be a committed capitalist to afford one, though – the estimate here is £80,000 – £120,000. This 1957 Samba was restored in 2014 and has been repainted in its original colours: Sealing Wax Red and Chestnut Brown. 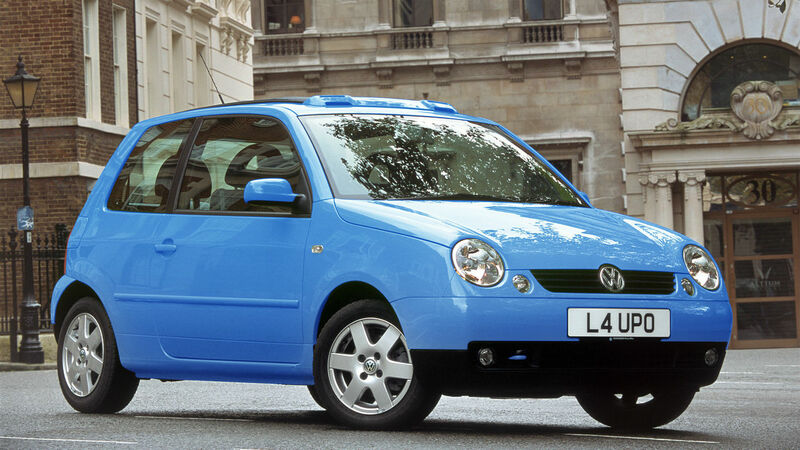 With a 1.5-litre air-cooled engine derived from the VW Beetle, it’s safe to assume performance is… steady. The interior of the Microbus has been retrimmed in its original light brown, while much of the glass was replaced (no mean feat when you have 23 windows). If you can afford the asking price, there’s no cooler place to camp at Goodwood. Welcome to the world of classic cars, where a rust-ravaged wreck can be worth £600,000 – £900,000. However, this Aston Martin DB team car isn’t any old jalopy: it finished seventh at Le Mans in 1949, then fifth in the Spa 24-Hour race two weeks later. It was one of the earliest Astons to bear the ‘DB’ initials of new company owner, David Brown. Years later, the car was bought by Aston Martin enthusiast Christopher Angell, and even featured in a Le Mans demonstration parade before the race in 1971. However, as Mr Angell’s health declined, the car fell into disrepair. It was left in his garden until 2002 – when it was stolen. Thankfully, the car was eventually recovered via litigation, and is more-or-less intact apart from its missing 48-gallon fuel tank and modified radiator grille. It even still has the regulation Le Mans seals on the radiator cap and oil filler. If you’re brave (and wealthy) enough to take this project on, the result could be something really special. Another historic British racer comes in the shape of this Bentley 4¼-litre two-seater – estimated at £80,000 – £100,000. 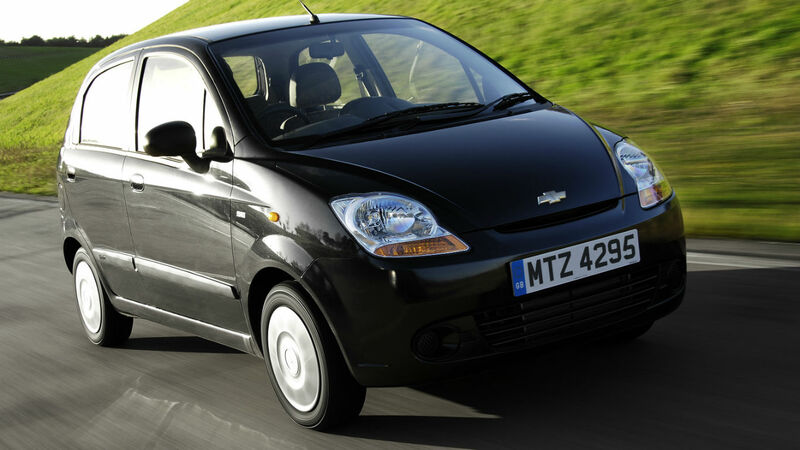 However, this car’s success has all been in recent years. First registered in 1936 as a four-door ‘Park Ward’ saloon, it was rebodied as a two-seat roadster in the 1980s. The Bentley’s fate was sealed after being left in an orchard near Birmingham for 18 years. Described by Bonhams as being ‘beyond restoration’, a similar car was acquired to donate parts, with new custom bodywork made, and the engine rebuilt by Hass Motorsport. The standard drum brakes were retained, albeit with the original lever/rod mechanism replaced by a twin-circuit hydraulic system. The car last raced in 2006, when it finished third in the Le Mans 100th Anniversary race. Apart from offering good, old-fashioned fun on the road, VSCC eligibility papers and an FIA passport make this Bentley a tempting entry-ticket for historic motorsport. Flying goggles are optional. From the sublime, to the… OK, we’ll admit we’re not fans of Sir Peter Blake’s ‘Pop Art’ Bentley Continental. But as the car is being auctioned for charity (with no reserve), we won’t be unduly critical. All proceeds go to Care2Save, which supports palliative and hospice care around the world. Sir Peter Blake is most famous for co-creating the sleeve for ‘Sgt Pepper’s Lonely Hearts Club Band’ – the Beatles’ classic 1967 album. His design for the Bentley is similarly bold and bright – its most distinctive feature being a large red heart on the bonnet, said to be ‘a symbol in-keeping with the compassionate work of hospices’. The car’s literal heart is a twin-turbo 4.0-litre V8. It also boasts contrasting seat trim, with Sir Peter’s signature on all four headrests. The work was completed by Mulliner, Bentley’s specialist bespoke coachbuilding division. Continuing the rock ‘n’ roll theme is this Jenson Interceptor Mark III Convertible, originally owned by John Bonham of Led Zeppelin and estimated at £45,000 – £55,000. The car has covered 50,600 miles from new and, remarkably, has avoided any swimming pools during its 40-year life. Probably for the best – we can’t imagine that hood is especially watertight. 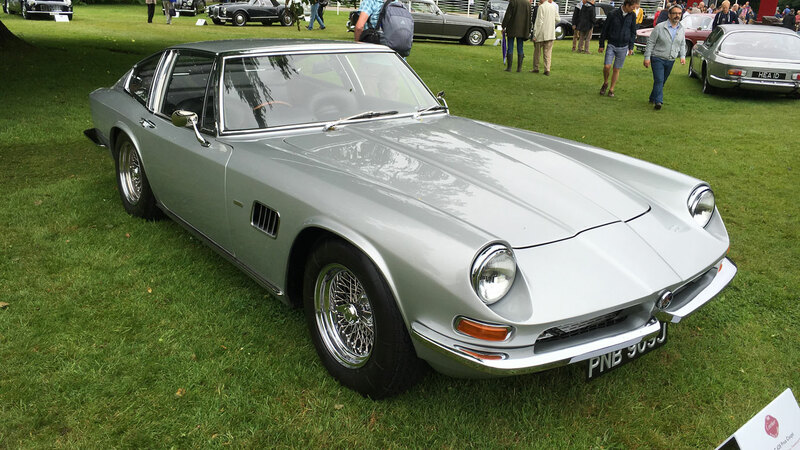 With Italian styling, a British badge and an all-American 6.3-litre V8, the Jenson Interceptor is our kind of hybrid. Only 452 convertibles were made, making this late-model Mark III version very sought-after today. When John Bonham bought this car, it was white with red leather trim and chromed wire wheels. Today, it looks rather more tasteful in black with a retrimmed black seats. Bonhams reports that one recent owner used it for driving holidays to Scotland with his wife and three children. Grand touring indeed! After years of victories on the racetrack, Maserati wanted to establish itself as a maker of fast and luxurious road cars. Its initial salvo was the 3500 GT of 1957, a 2+2 coupe with sleek aluminium bodywork by Carozzeria Touring. This car dates from 1960 and is expected to sell for £180,000 – £220,000. Total cost of the restoration was more than £120,000, which starts to make the car look comparatively good value. It’s certainly much cheaper than Ferraris of the same era. Total mileage is 56,300, with just 3,690 miles added over the course of the last eight years. Did we mention expensive Ferraris? 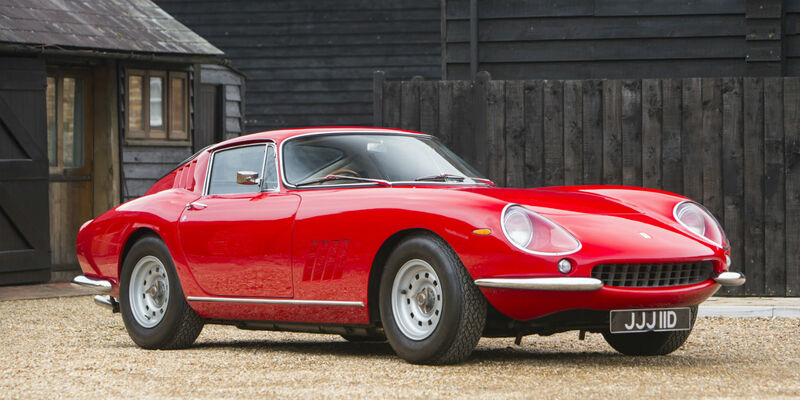 This 275 GTB/6C Berlinetta has an estimate of £1.6 million – £1.9 million, but looks worth every penny. Widely regarded as one of the most beautiful Prancing Horses ever, it’s powered by a 300hp 3.3-litre V12 with no less than six carburettors. This car was originally owned by Mark Konig, founder of the Nomad racing team. It was fully restored in 1991 – but had an engine rebuild in 2009, at a cost of (gulp!) £37,000. The car has only covered around 1,300 miles since the rebuild. You’ve seen the hype about the new Alfa Romeo Giulia – now meet the original, valued here at £175,000 – £225,000. 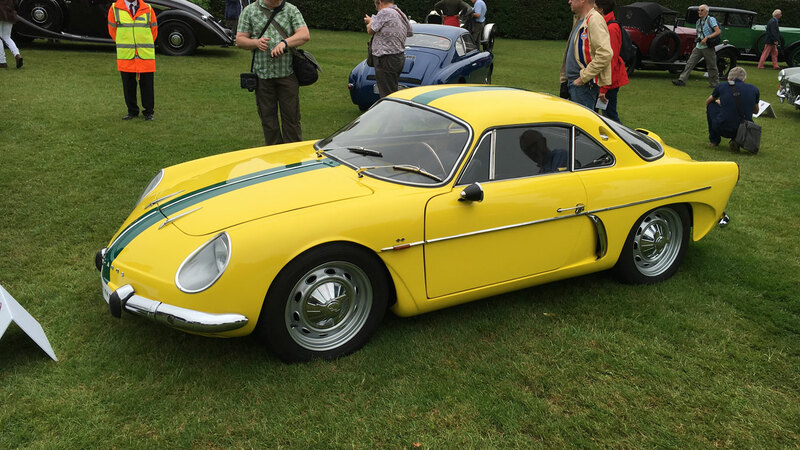 Introduced in 1965, the GTA was the racing version of the Giulia Sprint GT. The ‘A’ stood for Alleggerita, or ‘lightened’. It had aluminium body panels and Plexiglass windows. The GTA enjoyed outstanding success in European Touring Car events during the late 1960s, and this car remains eligible for historic racing. Period accessories include Campagnolo magnesium wheels and a large-capacity fuel tank for endurance events. A modern gel battery provides improved reliability. Bonhams says the GTA is ‘tremendous fun to drive’ – and we can believe it. A full 200kg lighter than the regular Giulia GT, its twin-cam 1.6-litre engine produces up to 170hp in full race trim. Bet it sounds fantastic, too. To B or not to B? Is this the car the MGB should have been? The pretty EX234 prototype was designed by Pininfarina and bears a striking resemblance to the Alfa Romeo Duetto (immortalised on film in The Graduate). 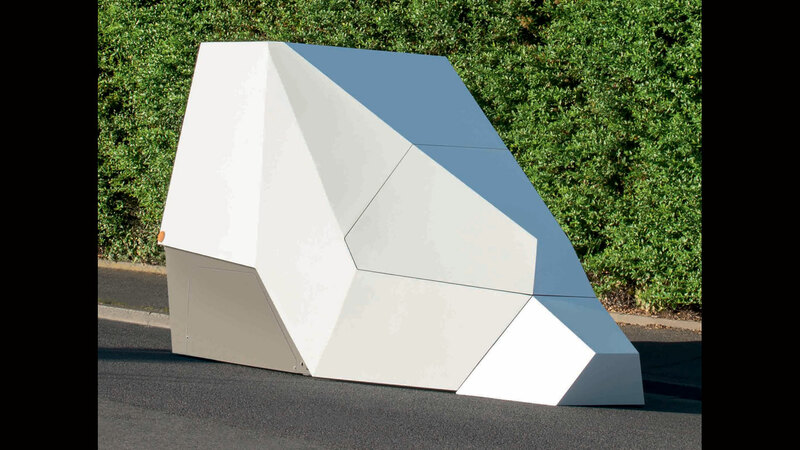 It’s expected to sell for £35,000 – £45,000. It might look mildly exotic, but underneath EX234 used BMC’s familiar 1,275cc A-Series engine and gearbox, an Austin Champ rear axle and Hydrolastic suspension. Since leaving the factory, this one-off MG has been owned by a single family, spending many of its years on display at the MG Museum in Cambridgeshire. Sadly, EX234 never made it into production. The MGB was still selling well in 1965, and BMC was looking towards Triumph as its favoured sports car brand. 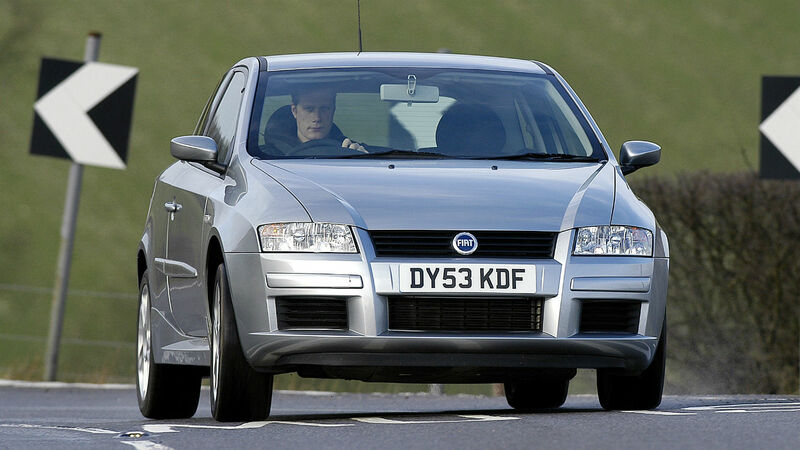 A shame – even celebrated racing driver John Surtees rated EX234’s handling after driving it at Silverstone. This one needs little introduction. The E-Type regularly tops polls as the best-looking car of all time. Its phallic bonnet, muscular haunches and sleek, tapering tail haven’t dated a day. This 1963 Series 1 Coupe has stayed within the same family since new and is estimated at £60,000 – £80,000. Bonhams describes the 3.8-litre S1 as ‘the Jaguar E-Type in its earliest and purest form’. 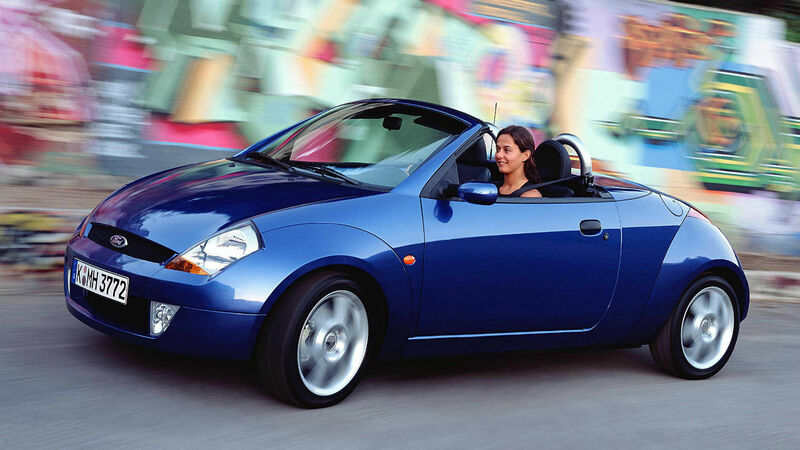 With 265hp from a triple-carb engine, it wasn’t just a pretty face either. A 150mph top speed was enough to grab headlines in the early 1960s. We finish our Goodwood auction round-up with another Jaguar. Or do we? When the SS100 was launched in 1936, it was a product of SS Cars – only the model name was ‘Jaguar’. The subsequent rise of Nazi Germany tarnished the SS name, and William Lyons renamed his company after the big cat in 1943. This 1938 car is estimated to sell for £180,000 – £260,000. This SS100 has been raced and rallied over the years and Bonhams says the bodywork needs some restoration. The engine block has been swapped for a later Jaguar Mark V item, but the bronze cylinder head is original. The car was resprayed British Racing Green in the late 1960s. Only 214 cars had been made by the time SS100 production was halted by the outbreak of World War II. Today, much of the appeal of this car for prospective owners comes from its eligibility for historic motorsport. It’s surely a must-have for serious Jaguar collectors, too. Be afraid. Be very afraid. If you thought you had the upper hand over average speed cameras, mobile safety cameras and fixed Gatsos, all that could be about to change. The Vitronic Enforcement Trailer is coming and it hasn’t had any dinner. 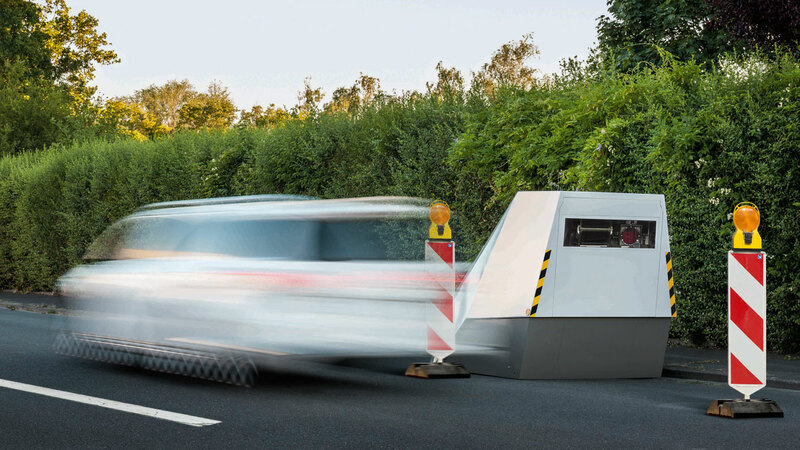 This autonomous speed enforcement system is able to reach parts other speed cameras cannot reach, including areas without power supply and in situations where it would be too hazardous for a human to set up a mobile device. With the Enforcement Trailer, there’s simply no hiding place. The French Ministry has already purchased 150 of these menacing machines, with 50 already in operation in France. So you may have been caught by an Enforcement Trailer – you just don’t know it yet. And be warned: there’s every chance these Robocops of the roadside will venture across the English Channel and into the UK. Vitronic is probably one of the biggest companies you’ve never heard of. From its Wiesbaden headquarters it specialises in industrial automation, logistics and traffic technology; supplying speed and red light enforcement systems and license plate readers to the public and private sectors. Many toll system operators use its TollChecker system to automate toll collection and enforcement. According to the German firm, the Enforcement Trailer makes “zero demands on the local infrastructure” and is ideal for rural roads, work zones and areas where it can be left unprotected for long periods of time. A long battery life and armoured shell ensures it can catch the maximum number of speeding drivers over the longest period of time. Indeed, the Enforcement Trailer – a name that in itself sounds rather sinister – has an independent power supply based on high-performance batteries, enabling an uninterrupted operation for five days. Asking a safety camera operator to work for five days without a break would be unethical. Not to mention illegal. Crucially, the light radar technology allows authorities to enforce speed limits of all vehicles across all lanes simultaneously. Variable speed limits and bans on through traffic specific to certain times, lanes and vehicle classes can also be monitored. In short, the Enforcement Trailer has got your number and if you’re up to no good, there’s simply no hiding place. An integrated modem transfers case data wirelessly via GSM and enables remote access to the measuring system. This means no human intervention is required between the time of installation and removal. At which point the Enforcement Trailer is dragged away, kicking and screaming, pleading for more action. Vitronic claims it can be transported by virtually any vehicle that has a tow-bar and it even has its own remote-controlled engine for precise alignment. 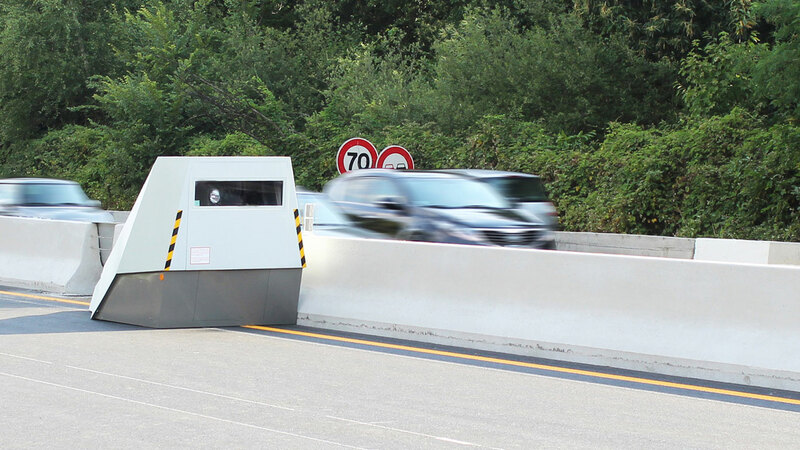 Once at ground level it’s extremely difficult for unauthorised parties to remove it, with the armoured shell and alarm system helping to protect it from anyone who may have been caught by the box that’s set to launch its own war on speed. They may look like a cross between a cash machine and a recycling bin, but they could soon be coming to a roadside near you. We have just one question: assuming the Enforcement Trailer is not monitored by CCTV, what’s to stop someone sticking a blanket over the top, therefore rendering Robocop useless? 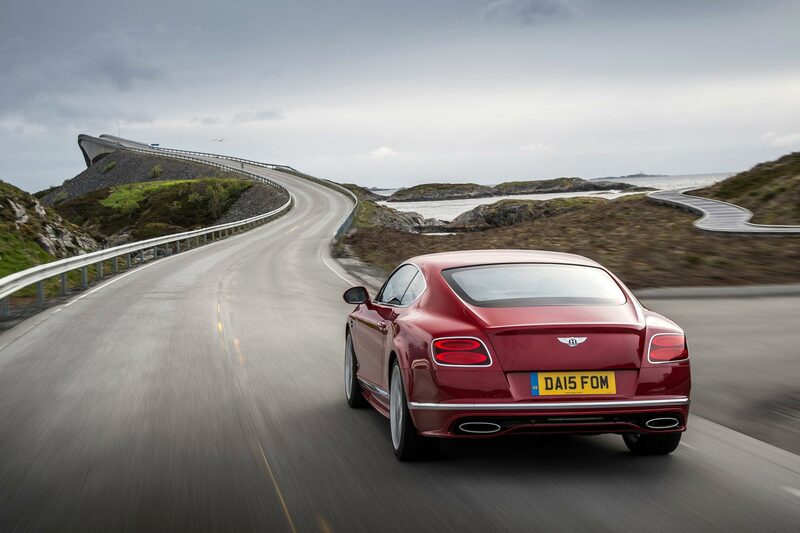 The Continental GT has been the saviour of the Bentley brand, responsible for bringing the company from the abyss to become the world’s most successful manufacturer of luxury cars. 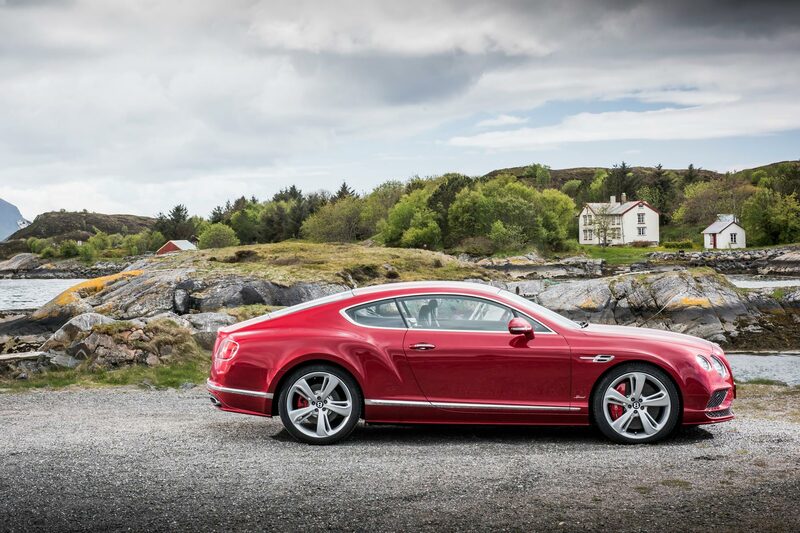 Today Bentley sells over 11,000 cars every year, half of them Continental GT coupes and convertibles. 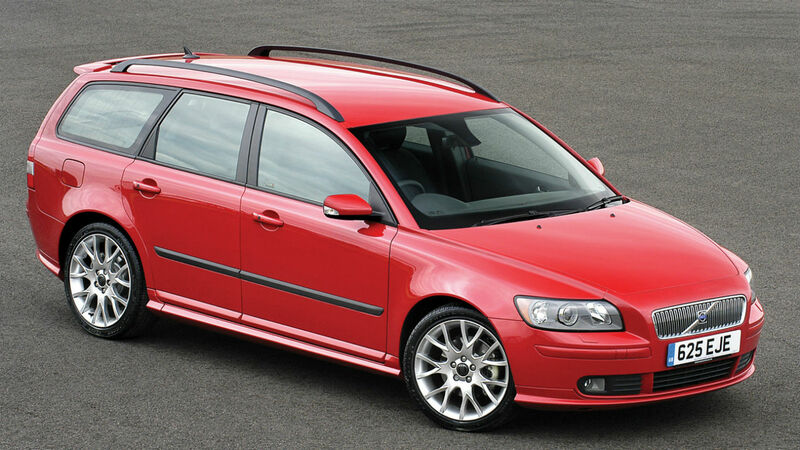 This car has started life in 2003 and has undergone several major changes since then, some major, others minor. From the original GT coupe with its astonishing 6.0-litre twin-turbo W12 configuration engine, the range has grown to include a second body style, the convertible, a more environmentally-conscious 4.0-litre V8 (OK, that has twin turbos and a ridiculous amount of power too), plus race cars from which the extreme GT3 road car has been developed. What was so clever about the original Continental GT, its trump card, was that it pitched in at £120,000, an area of the new car market where there really wasn’t much competition. 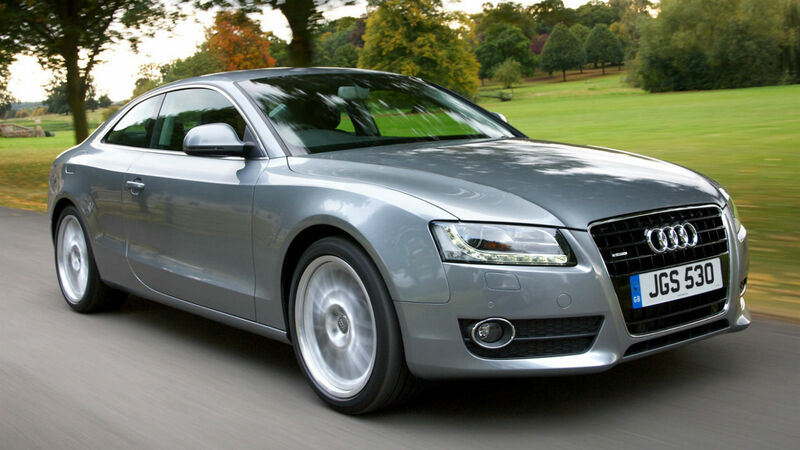 Suddenly there was a true luxury car available for the price of a top Mercedes. Buyers the world over were entranced. Naturally it’s a bit more expensive today. 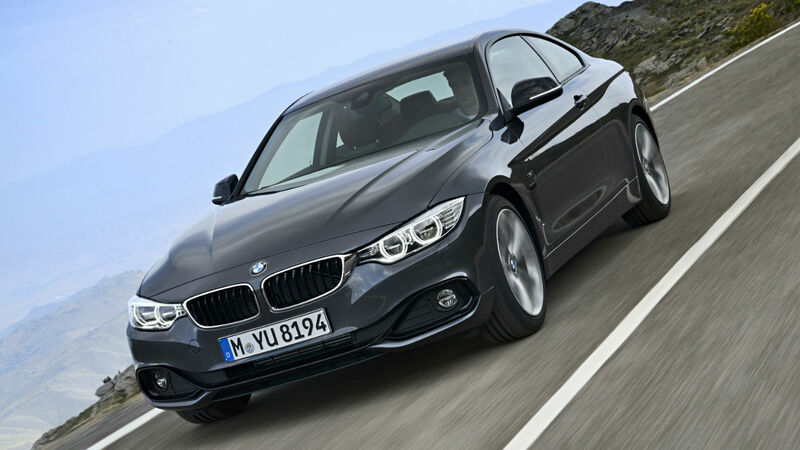 The V8 Coupe starts at £140,300, the Convertible £14,000 more. 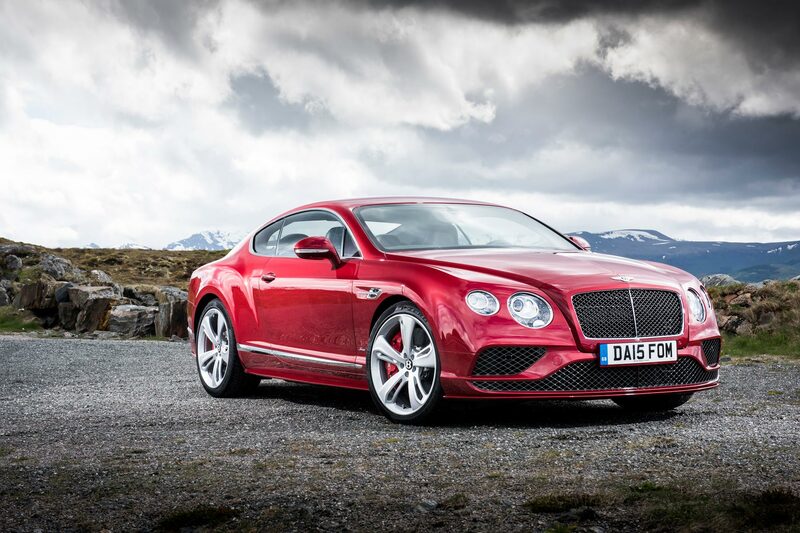 The step up to the GT W12 starts at £150,500, with the more powerful GT W12 Speed from £168,300. It’s still hard to pin down much in the way of direct competition – high performance coupes that offer the possibility of seating four – but the new Mercedes AMG S65 Coupe comes closest, at £183,075. 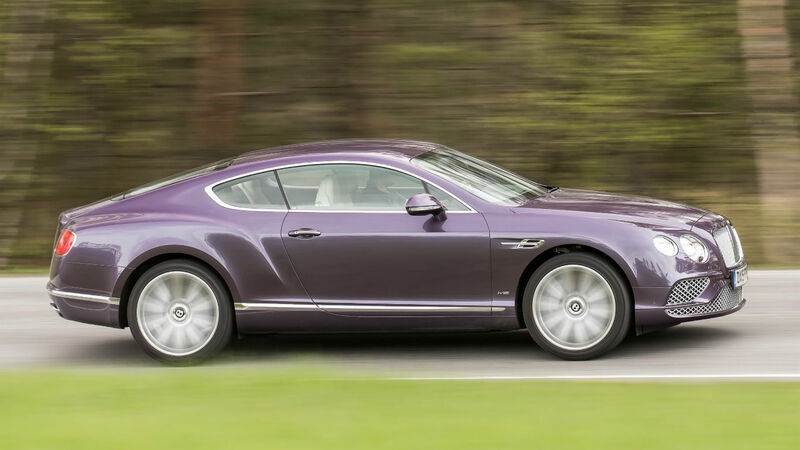 There’s a minimum of 500hp available in every Continental GT, but the pinnacle is the 635hp GT Speed. 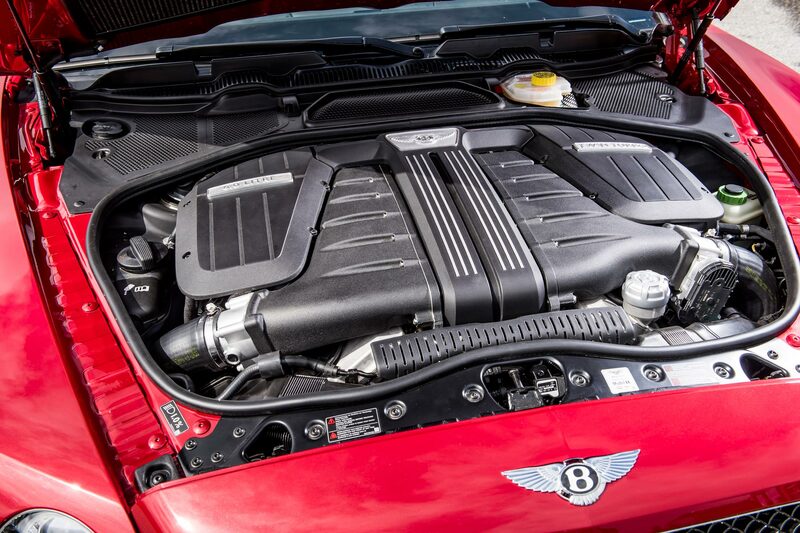 The W12 engine is smooth and refined when you want to cruise around, but slip it into Sport mode, or simply pull on the (now larger) paddle shifters, and this Bentley surges forward with a seemingly never-ending explosion of acceleration. It can, Bentley says, reach 206mph and cover 0-62mph in 4.2 seconds. Yet the regular GT W12 is a very fine car, too. 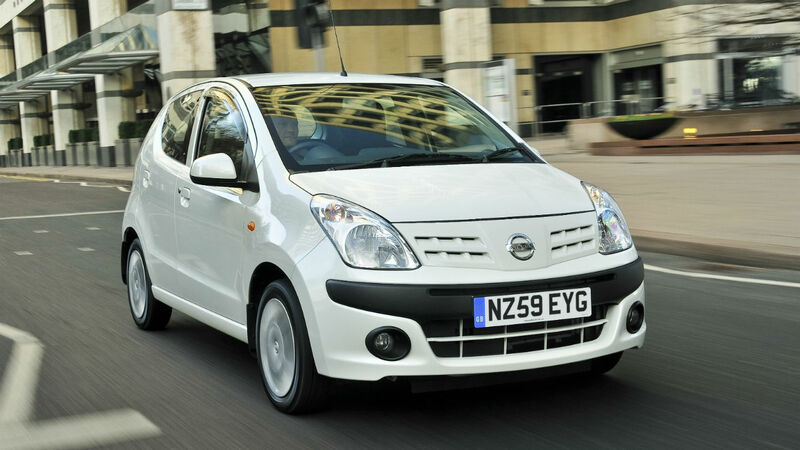 And if you hadn’t driven a Speed, you’d surely be more than happy with this model. 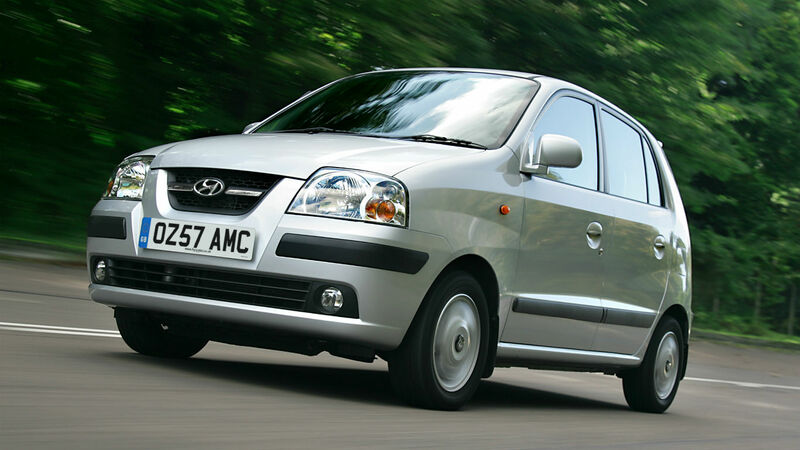 With its greater emphasis on comfort and refinement, it’s quieter and rides a little more smoothly. The V8 and V8 S Continentals have a similar relationship to the W12, the 507hp V8 is more comfy, the 528hp S more dynamic. Either gives solid thrills, and you shouldn’t overlook that fact that they are still magnificently powerful even though they slot in below the W12. Slip the V8 S into Sport mode and there’s a delicious crackle from the exhaust, a really sharp throttle response and a Continental GT that many will find the most enticing version of all. 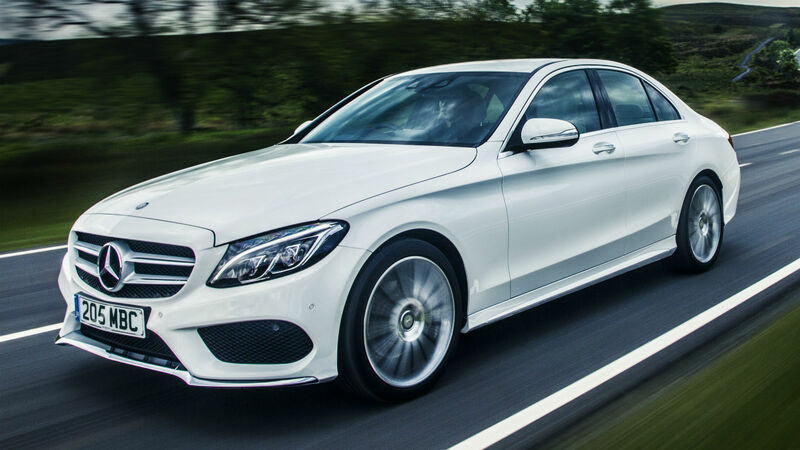 Although the V8 engine is barely lighter than the W12, it somehow seems to have greater agility. Four-wheel drive is standard, which results in tenacious levels of grip, even on the streaming wet roads of the Norway. 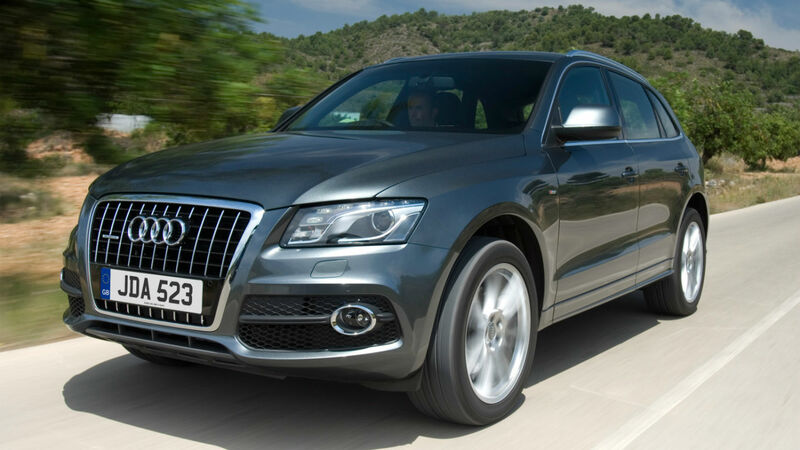 Transmitting the power through all four wheels also means that the traction when accelerating is astoundingly good. Less satisfactory is the tendency of the tyres to aquaplane in the wet, and to follow “tramlines” in the road surface. It’s worse on the optional 21-inch wheels. It would be churlish not to mention that the engines all have a touch more power. You’re not likely to notice the difference, though, unless you take your Bentley to a race track. Where the Bentley Continental is still able to frighten competitors is the way it blends that performance with fabulous levels of interior appointment. 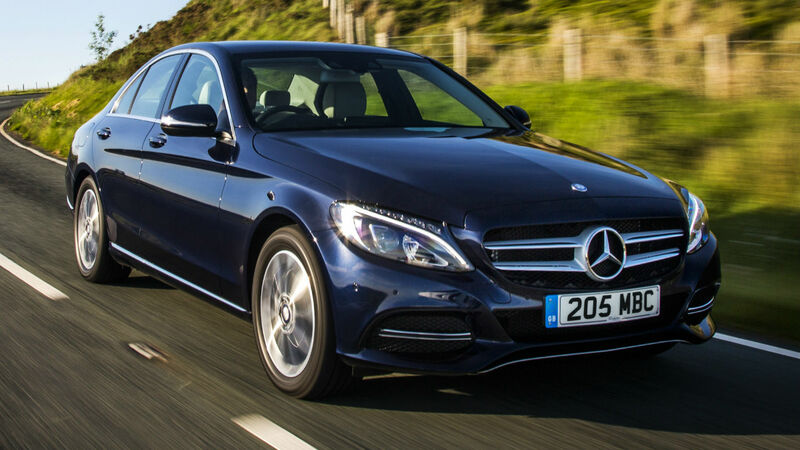 It feels like a proper, hand-built luxury car, which Mercedes might equal, even better, in terms of functionality, but remains way off for that sublime feeling of decadence. Quilted leather seats, architectural dashboard structure, beautifully hewn metalwork. There’s now a softer, semi-aniline hide for the seats on the W12, a sportier steering wheel and on-board wi-fi for the first time. It’s only 3G, but it’s still welcome. The Continental GT is comfortable, naturally, but you can tailor the ride to suit your mood through four grades from Comfort to Sport. If you don’t want to be bothered, well, the computer second-guesses your requirements according to your driving style. Luggage space is enormous. Rear-seat space, as ever, is tight on legroom. Running costs? If you need to ask, etc, etc. Tweaks to the W12 engine include ‘variable displacement’, which actually means that six of the 12 cylinders can be shut down to save fuel when deemed appropriate. 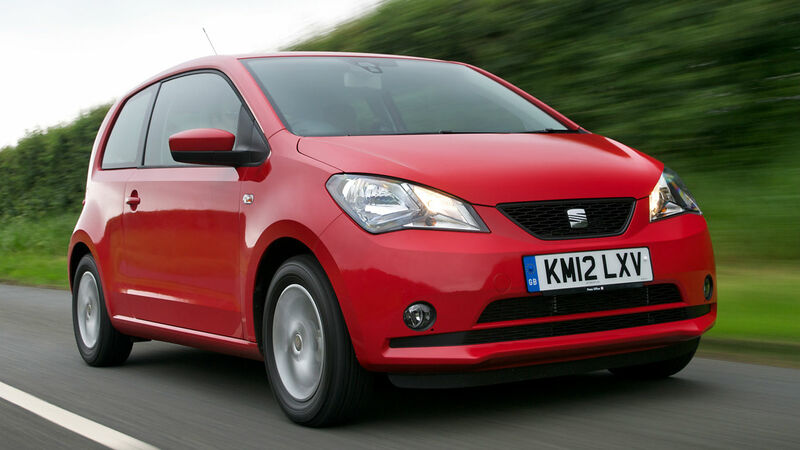 That results in 5% better fuel economy, although that still means 20mpg will be an achievement to be proud of. We saw 9mpg on the trip computer on a short stretch of closed road driving! 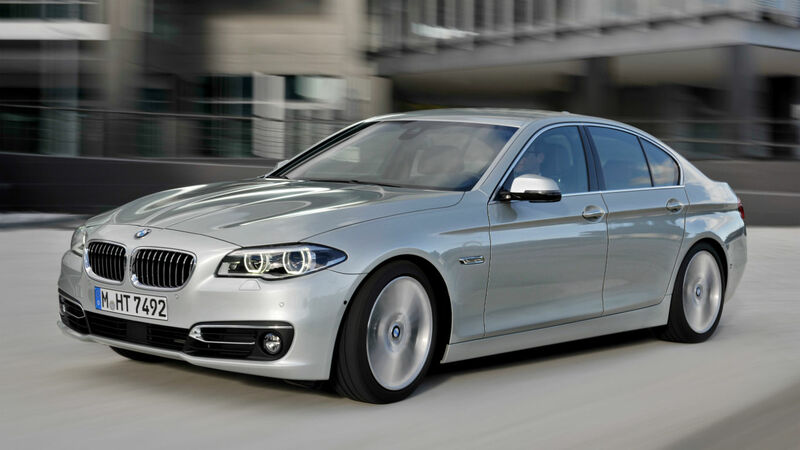 The V8 is better, with a combined figure of 26.7mpg and CO2 emissions of 246g/km. 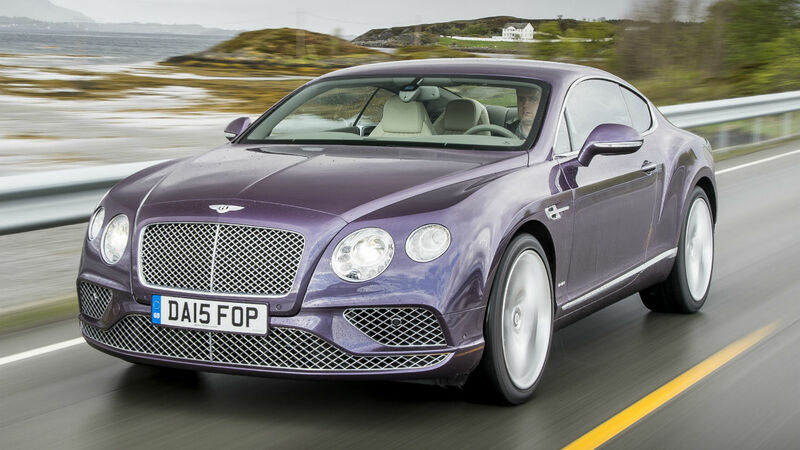 Depreciation is a bit of an issue with the Continental GT. The fact that a lot have been sold means they lack rarity value second-hand. Then there is the fuel economy, a concern more for used car buyers than those that can afford £150,000 to £200,000 for a new Bentley. That much? Well, yes. You need to take the list price with a pinch of salt because a nice palette of options can easily add £30-£40k. When it comes to weighing up the Bentley Continental GT, there’s always an elephant in the room. This car has been around for a dozen years already. Has it really established itself as an icon, something akin to a Porsche 911, a design that simply needs refreshing from time to time, rather than a radical rethink? Bentley’s sales volumes speak for themselves. With well over 5,000 examples of the Continental finding customers each year, it’s clear that the formula has generated a genuine desire amongst buyers. 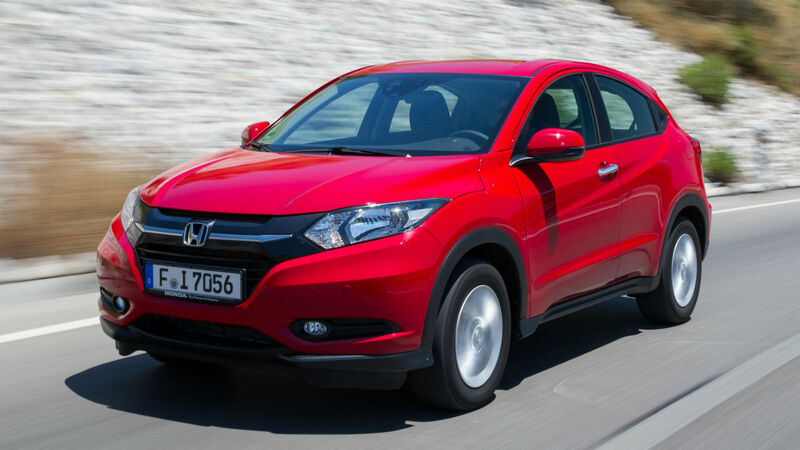 The 2016 changes of new bumpers, a smaller grille, side vents with metallic ‘B’ design, plus the engine and interior tweaks, are minor and might even be considered trivial. Yet today the Bentley Continental GT still makes a strong impact on three key levels: it looks menacing, the interior is gorgeous and the performance is breathtaking. That still makes it a very special car.